This section covers the rest of the residents and tribes of the Americas whom were present before colonialization by European peoples. 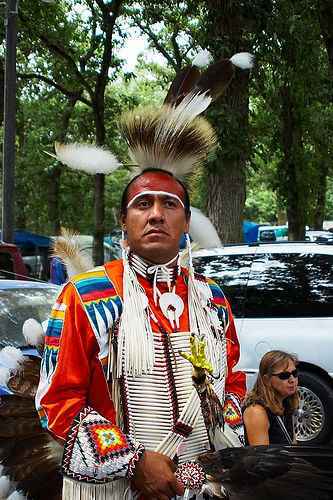 The image below was taken at a Winnebago Tribe Pow-Wowon July 31, 2005. It illustrates the resilience of Native American tribe who work to keep their culture intact within this ever-globalizing world. Click the image to see the entire collection, at the photographers website (photos copyrighted by photographer). Wikipedia, a free, collaborative encyclopedia entry on Native Americans. A project that enables the exchange of Native American materials for teachers. Read an article about Cradleboard in the Bozeman Daily Chronicle here. The Kanatsiohareke (Clean Pot) Mohawk Community, led by traditional chief Tom Porter, is a traditional Indian group dedicated to living the Old Ways. At their place you can visit, stay overnite, help out, or shop at their Craft Store. These are people living their traditional/moral/spiritual lifeways every day, not always an easy thing to do in the context of our crazy US American society. Please support them in any way you can. Updated March 30, 2009. This work is licensed under a Creative Commons License, and is valid CSS and HTML 4.01T. Logos are copyright their respective owners, used under fair use.